Did supermassive black holes start out big or small? How Did Supermassive Black Holes Get So, Well, Supermassive? 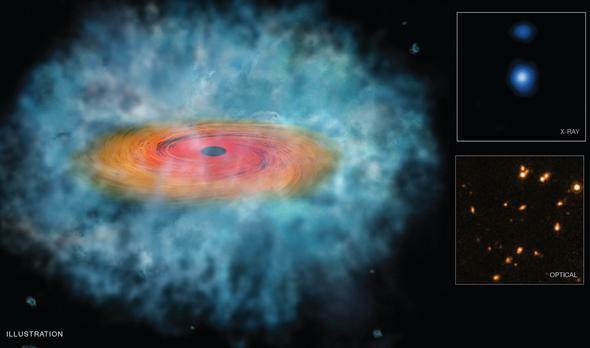 One of the two bouncing baby supermassive black holes found in a survey (right), along with an illustration of what they might look like up close (left). Supermassive black holes are a bit of a problem. Well, some of them power the most luminous objects in the Universe, spewing out high-energy radiation and matter at close to the speed of light, probably sterilizing all of space for thousands of light-years around them. So if you’re too close, yeah, they’re more than a bit of a problem. But besides that, though, they’re a puzzle. Specifically, where do they come from? Do they grow from normal, stellar-mass black holes that feed off matter gluttonously, or do they grow directly from collapsing gas as galaxies form? This is a huge question in astrophysics right now, and no one knows the answer. But we’re getting closer, and a new, clever bit of research may be a signpost to how these monsters are born. OK, first, what am I talking about? Supermassive black holes are huge, with millions or billions of times the mass of the Sun. We think every big galaxy has one in its very center, and we know each forms along with its host galaxy itself; both have properties tied to each other. There’s no doubt they’re related. That means that the supermassive black holes we see in big galaxies today formed along with their host billions of years ago. But how? Galaxies form as huge clouds of gas in the early Universe collapsed under gravity, forming stars. Some of these stars were very massive, which means they lived short, furious lives and exploded. Their cores collapsed to form black holes, some probably with 100 or more times the mass of the Sun. It’s possible a black hole like that started off in the center of every galaxy, then fed on gas falling into the galactic center to grow huge. Or, it’s also possible that the gas that formed the galaxy itself poured into the center and formed a black hole directly, probably starting with a mass of 100,000 times the Sun or more. 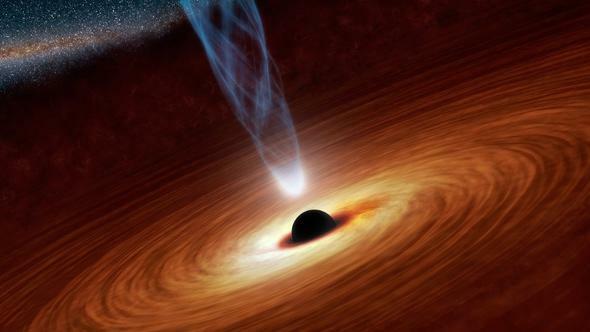 Illustration of a black hole with matter swirling around it, focusing its energy into beams that can travel across the Universe and be detected by us on (or slightly above) Earth. Well, forming the smaller black holes first and having them grow in size has a big problem. It takes too long. As material falls in it tends to form a disk around the black hole, which heats up tremendously and glows fiercely (which is why black holes can be so bright—or, more technically, provide the power for intense luminosity—as I said above). That huge amount of energy will slow the incoming material, making it harder for the black hole to grow. Even assuming the best conditions, it means we shouldn’t see million or billion solar-mass black holes when the Universe was less than a billion or so years old. But we do. And that’s a problem. However, a group of Italian astronomers may have a way around it. If the material infalling to form the galaxy does directly form a black hole (that is, not forming a star first), it could start off with a mass of about 100,000 times that of the Sun. That could grow to supermassive proportions in the time allotted. But to confirm that, we’d need to find them, and to do that we need to know what they’d look like back then. It turns out that’s hard to figure out, with lots of different things affecting a nascent black hole’s appearance to us. To tackle this, the astronomers used a theoretical model to determine how such a black hole would emit light as it grew. It turns out the best way to see these objects is through the light they emit in the infrared and X-ray parts of the spectrum. Looking first at just the infrared light predicted, they then applied this to observations of the deep Universe using Hubble and Spitzer Space Telescope (which observe in the infrared) to look for distant candidates that emitted light matching what they predicted. The idea here is that the farther away the object is, the earlier in the history of the Universe we see it, and using these space telescopes allows us to see all the way back to when galaxies were first forming. They started with the 35,000 objects found in a deep Hubble survey called CANDELS (for Cosmic Assembly Near-infrared Deep Extragalactic Legacy Survey), a very deep survey that saw a lot of distant galaxies. They then narrowed the list down to about 2,000 objects located at the right distance from us to be seen when the black holes were first growing. The next step was to look for these objects emitting X-rays. That meant using the Chandra X-Ray Observatory, which was also used to observe the CANDELS fields. Out of the thousands of candidate galaxies, just two were also seen to emit X-rays in the right manner. But two is enough! Well, enough to show that their idea may not be wrong; having two objects doesn’t prove they’re right. But it’s very intriguing that they found any at all. It shows that it’s possible supermassive black holes get their start as directly collapsing clouds of gas, with no star needed to get things rolling. And the beauty of their method is that they can adapt it pretty easily to use with data from the upcoming James Webb Space Telescope, which is due to launch in 2018. Once that’s up, lots more targets can be identified because it’s a far more sensitive telescope than Hubble or Spitzer in the infrared. That’s exciting. We know these black holes are critical to the growth and evolution of big galaxies, galaxies like the Milky Way, the one we live in. Not knowing how they got there is a bit irritating. This method may not pan out, but it looks to me like a pretty good start on a way to figure out what’s what. And just having a plan, in this case, is very hopeful.